Just how much do we love Cotton+Steel fabrics? SO MUCH! For the next two weeks, we’re collaborating with the team over at Cotton+Steel to teach you about their fabric and inspire you to stitch up your new favorite outfit. Over the course of the next 2 weeks, we’ll feature 4 different substrate profiles, so you can walk away a Cotton+Steel fabric expert. On the Cotton+Steel blog, Devon will teach you about how Cotton+Steel fabrics are made. We are just as excited to see this behind-the-scenes look at their fabrics as you are! Here on the Colette blog, Katie will be sharing detailed fabric guides and insider tips for sewing gorgeous garments in Cotton+Steel substrates. Wondering which needle to use, how to avoid any shrinkage, or what types of projects work best for different fabrics? She’s got you covered. All patterns featured in this collaboration are also on sale for 15% off, starting today! No promo code needed, just head to the shop to see the Colette ♥ Cotton+Steel collection. 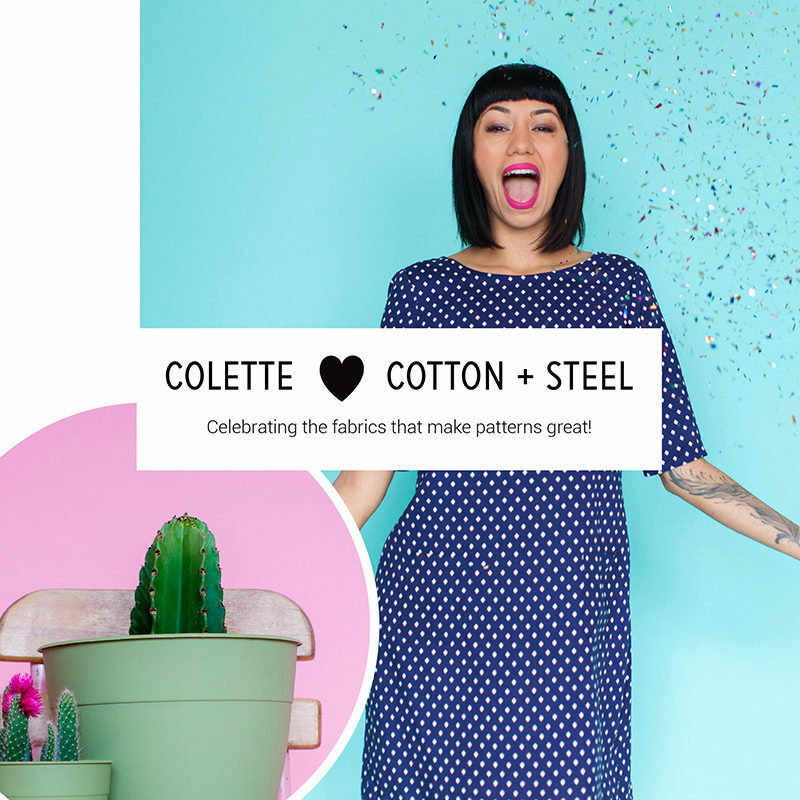 If you’ve sewn up a Colette design in Cotton+Steel fabric, join the party and tag your projects #cplovescs! How can we purchase cotton and steel online ? Could you share a url? Thank you! You can find retailers for Cotton+Steel through their site. If you are located in the U.S., Harts Fabrics is one of your favorite online retailers. Thank you Katie! I am in hawaii and our limited fabric stores do not have cotton and steel on my island. Online is the only way. Harts fabric is spectacular and I didn’t have them on my resource list before. Last week your email included comments from a man who sews and designs his own clothing. I clicked on the live feed from Yahoo and really enjoyed it. Now I have no clue how to get back there and listen to more stories. Please help and thanks. Love your emails. I think you’re talking about Seamwork Radio, our podcast. Here is a link to all the episodes. It’s also where new episodes will be posted! Since double gauze has two layers, it’s not as sheer as you might think, especially with all the fun prints! Katie covers double gauze in today’s post here, in case you missed it.